HOW TO STEP INTO SPRING WITH DEBENHAMS' RIVIERA TREND. | O. R. R. - Life & Style Journal. HOW TO STEP INTO SPRING WITH DEBENHAMS' RIVIERA TREND. Welcome back guys and if you're new on here, hello! Here's some spring outfit inspiration for you, courtesy of Debenhams. Now that it is officially spring, I'm looking forward to warmer weather and brighter days. Warmer weather means less layers and more ice-cream. 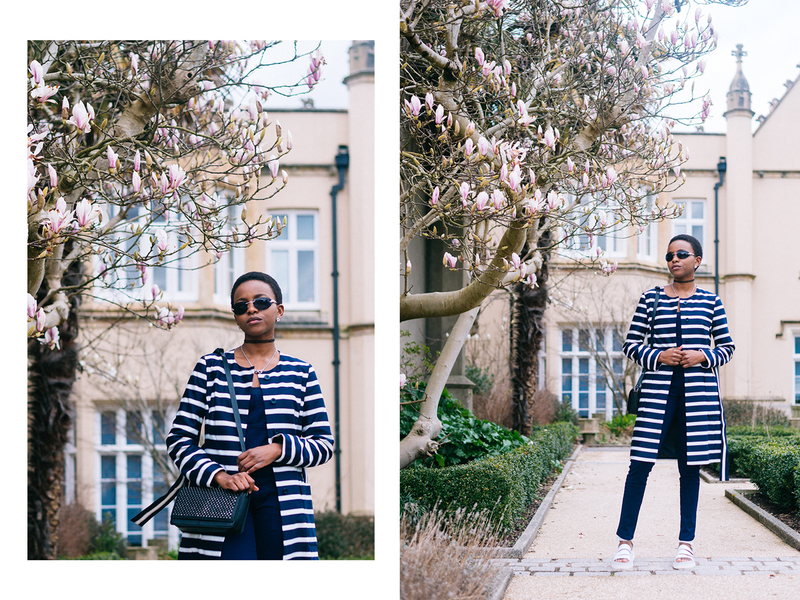 I was given the chance to pick and style a few items from Debenhams' Riviera edit. While browsing the website, the first thing that caught my eye was this J by Jasper Conran coat. It isn't too thick making it perfect for those cool "not-so-warm" spring days. I wear a UK6 but I got this coat in a size 8 which is the smallest available size. The fit is loose enough to fit an extra layer underneath on colder days. If you buy it now, you get 20% off. Go for it! I've wanted a pair of fitted dungarees for as long as I can remember so when I saw this H! by Henry Holland pair, I knew that I had to have it! I'm wearing a size 6 and it fits true to size. My only problem with it and every other pair of fitted jeans I own is that it doesn't hug my ankles. I paired the dungarees with my Dr. Martens' Clarissa sandals to give the illusion of a better fit around my ankles. I threw on a navy blue bodysuit underneath and kept my accessories simple. The Riviera trend features bold nautical stripes, denim and lots of blue and white. What do you think about my take on the trend? Would you wear this outfit? *This trend ties into the overall ‘A Match Made in Debenhams’ campaign which runs throughout the season, the focus of the campaign is to celebrate that moment when a look comes together perfectly for any customer. Make sure you check out Debenhams' Riviera Edit here. Want more inspiration on how to wear this trend? Click here. Below are my favourite items on the site. Click on the corresponding numbers to shop. What other trends are you loving this season?